And although not a big deal has been made of it, Honda has a history of venturing off into new directions. The company’s tiny two-seat Insight was the first modern hybrid when it arrived as a 2000 model; the Civic GX remains the only mass-produced car that runs on compressed natural gas; and several years ago, Honda put a handful of fuel-cell vehicles in public hands to gauge reactions. (The company has since followed that up with a second fuel-cell vehicle; more on that later). So it’s perhaps not surprising that Honda’s foray into electric vehicles is more on the order of dipping your toe into the waters than jumping right in. Among the new crop of electric cars offered (and hybrids as well), manufacturers have gone in two directions. One is to build a dedicated vehicle (such as the Toyota Prius, which is offered only as a hybrid), the other is to convert an existing gas-powered model (such as the Toyota Camry Hybrid). 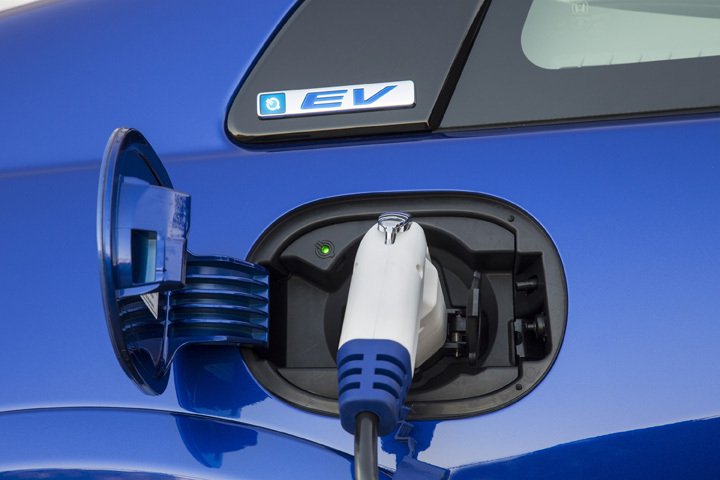 Among electric cars currently on the market, the Nissan Leaf is a dedicated vehicle, as is the Mitsubishi i (though a narrower version is sold in Japan as a gas model), while the Ford Focus Electric is a conversion. As might be evident by the name, the Fit EV is a conversion of the gas-powered Honda Fit, which has been either a Consumer Guide Automotive Best Buy or Recommended vehicle since its introduction for 2007. If you’re going to do a conversion, the Fit is a pretty good car to work with. In the case of the Fit, “going electric” has not only lowered the operating costs, it has actually improved some aspects of the car. One of our few complaints about the Fit has been that it is rather noisy, particularly under acceleration and at highway speeds. Much of that is due to engine noise, something the Fit EV eliminates, mostly by not having an engine. The electric motor that takes its place is virtually silent; its presence is made apparent only under acceleration, when it produces a subtle whine. Clamor on the highway is further reduced by improved aerodynamics and some added sound-deadening materials, the result being that “noise” isn’t an issue for the Fit EV. One other improvement brought about by the electric powertrain is better around-town throttle response. Although the gas-powered model is really quite good in this regard, almost any request for an increase in speed necessitates waiting for the transmission to downshift. Not so in the EV, as the “transmission” has only one forward speed, and the motor reacts instantly—and quite strongly—to throttle inputs. The car is also quick away from a stop; test examples were able to chirp their front tires on takeoff. 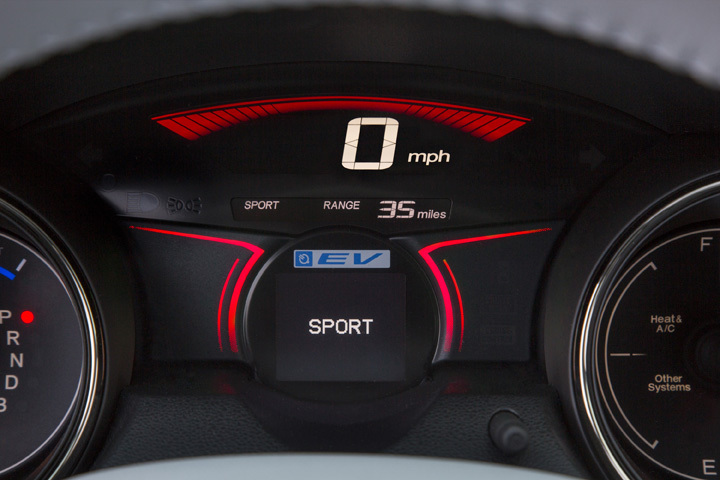 The only time the Fit EV doesn’t feel as powerful as its gas-powered brother is in highway passing, as the electric motor starts to run out of steam as it approaches the car’s 90-mph top speed. One other dynamic element that seems to have benefited from the electric conversion is a better ride/handling combination. Much of this is due to the fact that the battery—which is a “slab” mounted under the floor—puts more of the total weight low in the car, as does the low-mounted motor. All of this lowers the Fit EV’s center of gravity. This results in less body lean and improved handling with no degradation in ride quality, which was already quite good for such a small car. While there are some exterior styling tweaks that identify the EV version of the Fit (including a slash of silver “smiley face” trim that replaces the usual grille), it’s the interior that has received the most benefit. Gauges are quite colorful and informative without being too glitzy, while brighter trim and a two-tone color scheme dress up what is otherwise a pretty dull cabin. Remaining are all the nifty little cubbies and trays that help make a Fit of any flavor the gold standard for interior storage. One storage feature that didn’t make the EV cut, however, was the “regular” Fit’s multi-folding rear seat and resulting huge, flat-floored cargo area. The rear seat back still folds, but it rests a few inches above the level of the cargo floor, so large items can’t just be slid all the way in to the front seatbacks. 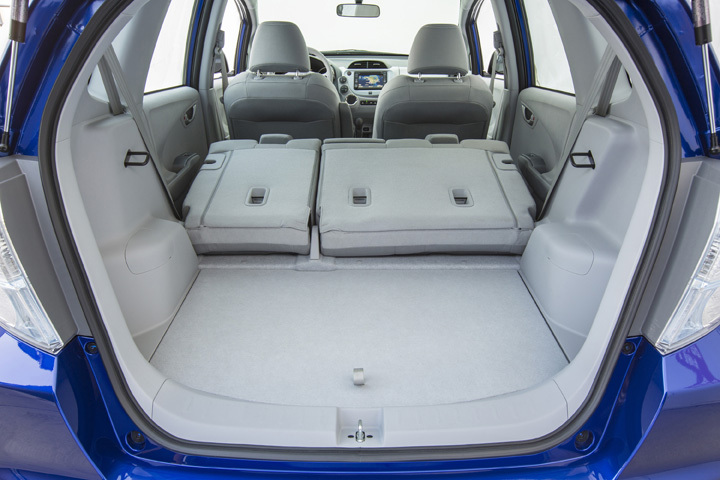 Also, the rear-seat cushion doesn’t fold up as it does in the gas-powered Fit, removing another handy storage feature we always liked. But overall, these changes only leave the Fit EV about par for the course among subcompact cars. Now for the numbers. The Fit EV has earned the highest EPA rating of any electric car: 118 MPGe (that’s “miles-per-gallon equivalent”). That tops the similar-sized Nissan Leaf’s 99 MPGe rating and even beats the smaller Mitsubishi i’s 112 MPGe rating. The EPA also puts the Fit EV’s range at 82 miles, versus the Leaf’s 73 miles and the i’s 62 miles. All of this probably makes the Honda Fit EV sound pretty attractive, at least as far as electric vehicles go. (Range pun not intended.) Trouble is, only a select few will be able to appreciate its beauty—at least initially—and they probably won’t be able to admire it long-term. Why? Because the Fit EV is only available in California and Oregon at first, with some East Coast states being added in the spring of 2013. Secondly, it’s offered only on a three-year lease, with the question of what happens to it afterward being somewhat up in the air. The good news is that the lease deal is quite attractive: $389 per month with $0 down—and that includes a bumper-to-bumper warranty, all maintenance, and collision insurance. Furthermore, our experience with electric vehicles has shown that they typically cost about two cents per mile to drive, a pittance compared to the roughly 15 cents per mile it costs to drive an average car on $3.50/gallon gas. The week before this was written, Honda announced that the first customers had taken delivery of their Fit EVs in California. Those people are among only 1,100 who will be able to do so over the next two years, as that’s all Honda is scheduled to build. But while Honda may only be dipping its corporate toe into the electric-vehicle waters, the Fit EV might just be good enough—and the lease deal attractive enough—that we suspect that far more than 1,100 people might be encouraged to take the plunge. Written by: Rick Cotta on July 27, 2012.on March 26, 2018. Driving on Sunshine: Can You Afford to Do It?